“Higher Self Now! 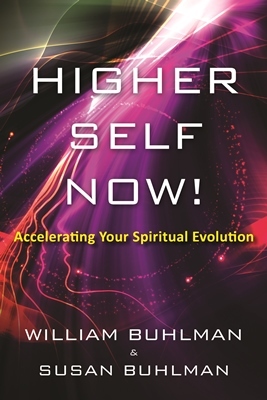 Accelerating your Spiritual Evolution” is now available through Amazon.com. This information is based on many years of research, observation, and experience with real stories of those who are supporting a loved one or preparing for their own transition. A chapter summary for Part One and Part Two is available below. Techniques and affirmations are provided to identify and remove your own blocks – both physical and emotional. My intent is to provide practical information and insights to empower you to have an enlightened life and transition. Thanks to all of you who have attended the Higher Self workshops at TMI and provided such amazing support for this project. My wife, Susan, and I wrote this book with the deep desire to help inform readers about the continuing reality of our existence and all that it implies. As a lifelong explorer through self-induced out-of-body experiences and meditation, I have written Part One of this book, which explores our opportunities for spiritual awakening, the multidimensional continuum of consciousness and the journey of soul that continues through our life, death and beyond. As a hospice volunteer and a certified end-of-life doula, Susan has written Part Two, which examines the transition we call death, suggesting a new paradigm for assisting our loved ones—and ourselves—in making the transition experience an effective launch pad for a profound spiritual journey. Knowledge of our multidimensional nature and the nonphysical environments we will enter helps to prepare us for our continuing journey beyond the body. Each reality we experience after death will provide us unique opportunities to learn and evolve. 1. Prepare for a Spiritual Transition – A terminal diagnosis or tragic event can hit us with so many material considerations, that our spiritual transition falls to a low priority. Prepare now and you will have time and energy to focus on your higher self connection. 2. Create a Safe Harbor: Bringing Comfort to Others – Even the most socially astute person can be uncomfortable around the dying. Here are some guidelines and ideas to make your visit supportive of a spiritual transition. 3. Dying is a Process – Visions, contact with the departed, OBEs and past life influences begin to increase as someone begins to approach their final hours. As the physical body begins to slow, the spiritual body increases activity. 4. Support a Peaceful Crossing – Whether or not you choose hospice care, there are a variety of alternative practices that enhance the spiritual aspects of transition. 5. The Doula: An End-of-Life Companion – Learn the practices and attributes of an end-of-life companion along with the benefits of having that kind of support system. 6. A Sacred Space and Time – Creating a sacred space for your loved one will demonstrate respect for the dying process, as well as, promote an atmosphere for maximum spiritual evolution. 7. The Unexpected Death – Providing a path to one’s higher self can be initiated at any time; before during or even after the physical body has ceased to function. Be prepared to lend assistance at any time. 8. Release the Spirit – Grief is a personal process. Consider some points to help lessen the impact that this can have in your life and allow your loved one to move on rather than be tied to your grieving. 9. Celebrate the Life Experience – Memorial services can be pre-programmed by an institution or be a positive celebration that sends a message of encouragement to continue spiritual evolution. 10. Document Your Spiritual Directive – This is a place to explore and document your wishes for those that will be responsible for your transition plan. Connecting to your higher self is possible before, during and even after the physical death. However, this is easier to accomplish when you have knowledge of the dying process and feel more comfortable with what to expect. Whether there is a terminal illness or sudden death, having a spiritual support plan already in place will help you to navigate through a highly emotional time. Order from Amazon Here ! all explorers of consciousness. For all that are awakening to a simple truth – spirituality is experienced, not believed. To the many people and organizations that comfort the body and soul during the last hours of physical life: your gift is immeasurable. Whether you are a medical professional, social worker, grief counselor, volunteer, administrator, compassionate friend, doula, caregiver, educator, or concerned family member—yours are the helping hands that serve those in transition. As such, a portion of the proceeds from this book will be donated to non-profit organizations that assist and comfort the dying. Copyright © 2016 Astral Info, All rights reserved.